Jesmonite is a versatile range of water-based and cement based, solvent free composite materials ideally suited to the creation of decorative mouldings and glass reinforced laminates. These materials have a range of unique properties, which contribute to strength, durability, non-toxicity, and the ability to comply with many of the necessary test requirements of the construction industry, specifically those in regard to fire performance and impact resistance. 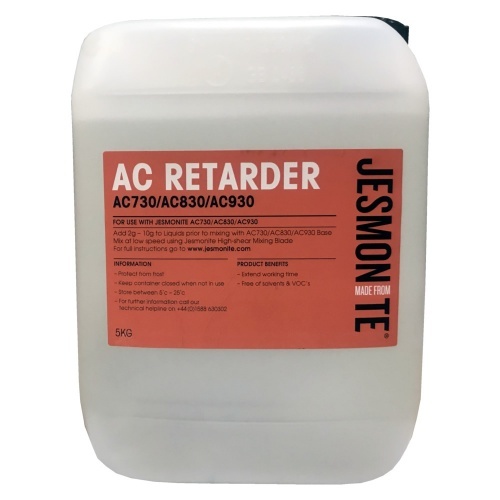 Set times of all Jesmonite Composite materials can be extended by the addition of Retarder to increase working time. Typical inclusion rates are 2g – 8g per kilo of mix. Please note that the end user should perform tests in the workshop environment, as extremes of temperature and humidity can effect set times. This retarder is suitable for AC730, but should not be used with the AC100/200/300 products.